Jackets are one staple of menswear that by no means seems to exit of favor. Right from the early Nineteen Sixties, the leather-based jacket, particularly, is something that has turned out to be a great iconic piece of favor. Overall, jackets have usually been a very good piece of style to spend money on, and getting an amazing leather-based jacket is something with the intention to clearly do you righter than harm.If you are deliberating shopping for a leather jacket for yourself or a person you already know, there are sure elements which you should bear in mind. Finding a leather-based jacket that suits you and all your necessities is crucial, and is something that may close you a large amount of time. 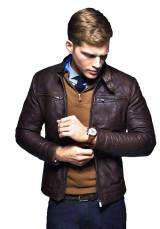 William jackets are one of the leading online shops that provide his customers with excessive great leather-based jackets at low cost. William jackets introduce the Superman Smallville Clark Kent Black Leather Jacket. Clark Kent used to wear this jacket in comic character film Superman. Clark Joseph Kent is an imaginary character seeming in American comic books published by DC comics. Created via Jerry Siegel and Joe Shuster, he debuted in movement comics and serves as the civilian and mystery identity of the superhero Superman.One of the most full-size elements that one must usually think about before they buy the product is the kind of leather-based that is being used. Now not all merchandise is made of the same type of leather-based, and every product tends to vary inside the kind of material, thickness, smoothness, coloration, and numerous different factors. The cloth that the jacket is made from must be one of the principal determinants on whether or no longer you have to go in for a jacket. this superman Smallville Clark Kent Black Leather Jacket is made of PU leather. It has viscose lining inside that will keep you warm in cold weather. It has a front zip fastening, stand-up style, and zipped cuffs. That is atop-notch leather-based material.Another jacket that William Jackets introduces is Smallville Logo Superman Clark Kent Maroon Leather Jacket. Get ready to enthrall your surroundings, dressing up in Superman jacket. It was introduced in the TV series and was worn by Tom Welling. It is made up of PU leather with viscose lining inside. It has YKK front zipper closure, stand up collar and zipper cuffs. Don’t miss the Smallville Logo Superman Clark Kent Maroon Leather Jacket to get an attractive look.